ARLINGTON, Va., Nov. 9, 2017 /PRNewswire-USNewswire/ -- As the nation observes Veterans Day this November, the USO is highlighting USO PathfinderSM, an innovative program with a unique approach to connect service members and their families to best-in-class support networks as they prepare for life after the military. USO Pathfinder offers one-of-a-kind assistance by utilizing the USO's global network to help service members achieve their personal and professional goals as they return home to their new communities. Many people know the USO supports service members throughout their time in uniform, but this Veterans Day we’re raising awareness about how the USO helps service members and their families successfully transition when their military service to the nation is complete. USO PathfinderSM delivers the USO’s mission by connecting service members and their families to the help they need to successfully transition from military service. 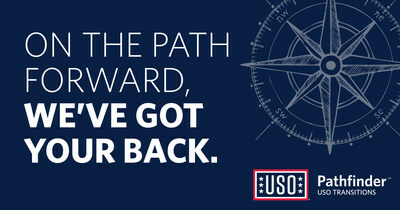 USO PathfinderSM sites focus on coordinating services via a human connection and state-of-the-art technology to help service members and their families navigate the transition from military service to thriving veteran status. "Transitioning out of the military can be tough — it requires service members to find new work and move their families into new communities," said Dr. J.D. Crouch II, USO CEO and president. "It's important to ask for help, and USO Pathfinder is there to assist our nation's men and women in uniform as they navigate their path from military service to thriving Veteran status." USO Pathfinder offers the highest quality of services to meet the broadest spectrum of needs – positioning the USO to become the nation's leading private transition resource for service members and their families. In October, The Boeing Company committed $5 million to help launch eight new Pathfinder sites across the country over a three-year investment period. This supports the USO's nationwide expansion to stand up 25 co-located sites with USO centers by 2020 which will allow USO Pathfinder to access 80 percent of all active-duty transitions each year. "The USO Pathfinder program works with strategic and supporting partners across key focus areas to develop relevant and valuable programming," said Anne Sprute, USO senior vice president, transition strategy and innovation. 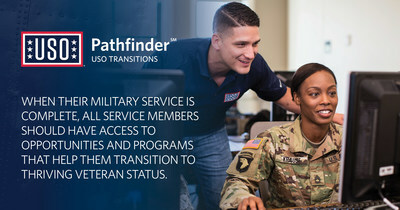 "With the support of the USO's corporate and strategic partners, USO Pathfinder establishes a bridge from military transition programming to public and private resources while ensuring service members are connected to best-in-class opportunities to support them in reaching their fullest potential in their new community." USO Pathfinder sites, co-located with USO centers across the country, focus on providing services designed around each service member's individual, post military service goals; service members are paired with a Scout (peer navigator) and empowered by state-of-the-art technology, the Pathfinder Action Plan mobile application. Pathfinder Scouts offer one-on-one support to active duty, Reserve, National Guard, military spouses and military dependents from 12 months before their transition and up to 12 months beyond their date of separation. Scouts are committed to leveraging external private resources while ensuring service members understand the value of their installation's Transition Assistance Program (TAP) through referrals that help them navigate the vast community of resources dedicated to their way forward. "A Pathfinder Scout's focus is to better inform, prepare and connect service members to their local network of transition programs and resources available," said Charlie Bailey, the USO Pathfinder senior director of site development & operations. "Pathfinder serves as a vital link to an often-underutilized set of services provided by a complex market of nonprofits and companies well-positioned to help." Additionally this month, the USO rolled out an upgrade to the USO Mobile Application, which will provide added agility to the Pathfinder program via an on-demand support function that connects service members to Scouts in their area. "The added USO Pathfinder features to the USO Mobile App will allow service members to locate Scouts and support systems near them," said Eli Hertz, USO vice president, information technology. "It will allow service members to communicate the areas of support that they need which will accelerate the customer service to our Pathfinder clients." In addition to the Pathfinder function of the app, all service members seeking USO services can benefit from downloading the new USO Mobile App resource which gives service members and military families the ability to find USO locations, discover USO programs and quickly check in when they visit the more than 200 USO locations worldwide. The free application is available for Apple and Android devices. USO Pathfinder was born from the USO's core belief that when the estimated 200,000-plus service members transition from military service each year, they deserve seamless access to opportunities so they can prepare for what's next after their service is complete. Focus Areas: Pathfinder Scouts provide direct connections to services and resources in the following focus areas: employment, education, financial readiness, veterans benefits, housing, legal, family strength and wellness and volunteerism. Action Plan: Through the creation of a personalized Action Plan, Scouts assist individuals in creating a plan that supports their timelines and their personal and professional goals. The individual is connected to best-in-class resources – national, local, in-person, and virtual – that are tailored to their specific interests and objectives. Continuously Tailored – Pathfinder Scouts maintain communication with individuals throughout their transition journey to confirm quality of service and to assist in updating the individual's Action Plan if goals or objectives shift. On-Demand Access – An individual's mobile-responsive Action Plan is at their fingertips anywhere in the world. They can update Action Plan tasks, add new tasks and communicate directly with their Scout. 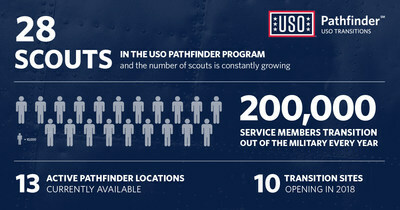 For more information on USO Pathfinder networks in your community, visit uso.org/pathfinder. The USO strengthens America's military service members by keeping them connected to family, home and country, throughout their service to the nation. At hundreds of locations worldwide, we are united in our commitment to connect our service members and their families through countless acts of caring, comfort, and support. The USO is a private, nonprofit organization, not a government agency. Our programs, services and entertainment tours are made possible by the American people, support of our corporate partners and the dedication of our volunteers and staff.